Almost three years ago I guessed, correctly, that Apple would follow its amazingly successful iPod with a phone. 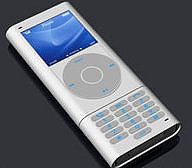 It's been a habit of mine -- since I wrote software for the first company to make a portable Mac years ago, I've not only bought into their big hits, but also their big misses like the Motorola Marco (the first wireless Newton) and Apple interactive TV (in 1991 they gave me one of their very first universal remotes). Powered by the SFF (Small Form Factor) version of the Centrino 2. Use Apple's increasingly useful multi-touch technology to power a virtual keyboard that you can "feel" when you touch-type, even though you're really using a solid slab of glass. Support wireless standards like Bluetooth and a more robust version of WiFi that works at distances of up to 1 kilometer (compared to 100 feet today). Have a moderate battery life (normally 2-3 hours, but about 90 minutes when using multimedia). Include USB and the multi-use connector launched with the MacBook Air. Use a new version of OS X that will not work with older PowerPC users (the last PowerMac G5 was released in October 2005). Today you can expect to pay $129 for the latest Apple operating system. I'm betting the price of the next revision to the OS will be around $69, less for education. Include the Safari browser and provide a full suite of web-based Office-software (word processing, spreadsheet, presentations, and email). Use only a few watts of power, compared to 100 watts or more with today's machines. Use MobileMe (Apple's flavor of cloud computing) to quickly share data with existing computers, iPhones and other iPads. MobileMe's launch with the iPhone 2.0 was a trojan horse designed to facilitate iPad adoption. Play new music, video and apps purchased from iTunes (since the iPad won't come with a DVD slot). Use iTunes to purchase and subscribe to digital versions of books and other print products, putting the iPad into competition with the Amazon Kindle. Eliminate the Carbon API (which until now has been critical for legacy Apple apps) and instead use the Cocoa platform (the old NeXT object-oriented platform). Support the authoring of full iPhone and iPad applications...making the iPad the cheapest software development platform yet. "...We're delivering state-of-the-art products at price points that our competitors can't match, which has resulted in market share gains in each of our products. We plan to continue this strategy and to deliver great value to our customers while making a reasonable margin but not a margin so high as to leave an umbrella for our competitors." Today, so-called netbooks are reportedly being sold for as little as $240. I don't believe Apple will try to match this price. But given the steep drop-off in Apple's projected gross margin to 30%, I believe a revolutionary pricing model is in the works. I believe Apple learned how to obsolete their own products with the iPod, and replicated the experience/cost curve with the iPhone. Now they have captured lightning in a bottle twice in a row, they have the confidence to price incredibly aggressively and are now asking Wall Street to buy into this vision. I believe Apple will price the iPad at $499, "...(riding) the cost curves down with value engineering and volume manufacturing, leaving us far ahead of our competitors." Next, computers at this price point will transform the lives of people everywhere. We're going to see incredible computational capabilities come into new markets like hospitality and retail. I'm guessing we'll soon see educational iPad pricing for around $250. It wouldn't surprise me to see a sub-$100 version available within 3-5 years to rural communities in out-of-the-way places like India and Africa. Apple has already filed patents on the kind of solar cell technology needed to fully power such devices. Lastly, Steve Jobs has learned the importance of locking in a huge developer community.Today, the iPhone software developer kit ("SDK") is free, but in order to write an iPhone app, you must use an Apple computer. I believe Apple wants to make software development as affordable as possible for as many people as possible. To do that, they are reducing the costs of the SDK, the operating system, the hardware, everything. To summarize, the iPad "razor" may only cost $499, but 25 million app downloads show a tremendous untapped market for razorblades, to the tune of 30% gross margins. By making a huge strategic bet on inexpensive computing just as global demand for a better life really starts to kick in, it wouldn't surprise me if Apple managed to build a worldwide developer community just as fanatical as its iPhone user base. Oct 10 Update: Based on this link, it appears that this unit will actually be priced at $800. Not quite "spitting distance" from $499, but still, a remarkable price departure.